On the very first day of the New Year, Gerald McCauley met up with Soundcheck host John Schaefer. 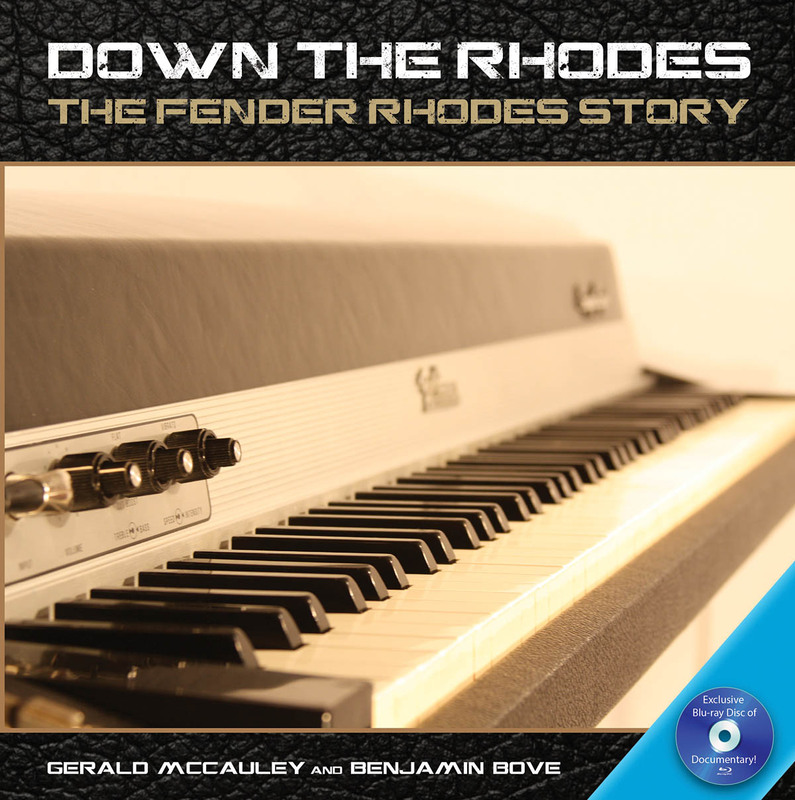 As one of the authors of Down the Rhodes: The Fender Rhodes Story (along with Benjamin Bove), Gerald has a lot to say about the history of this powerful and revolutionary instrument! The Fender Rhodes story is a historical tribute to the electric piano that changed the sound of music. Invented by Harold Rhodes as a rehabilitation tool for soldiers in World War II, the Fender Rhodes piano both revolutionized and empowered musicians to explore a new, electric frontier of music. Through interviews with a remarkable cast of music notables, the book takes an insider’s look into how this electric piano played – and continues to play – an integral role in the creation of a wealth of music, from the 1960s through today. The collection of interviews with Michael Bearden, George Benson, Stanley Clarke, Chick Corea, D’Angelo, Eumir Deodato, George Duke, Larry Dunn, Donald Fagen, Ronnie Foster, Rodney Franklin, Robert Glasper, Jay Graydon, Dave Grusin, Don Grusin, Onaje Allan Gumbs, Ellis Hall, Herbie Hancock, Lalah Hathaway, Rami Jaffee, Bob James, Quincy Jones, Ramsey Lewis, Jeff Lorber, Robin Lumley, Ray Manzarek, Les McCann, Marcus Miller, Steve Molitz, John Novello, David Paich, Jerry Peters, Greg Phillinganes, James Poyser, Patrice Rushen, Joe Sample, Lenny White, Maurice White, Vince Wilburn Jr., Allee Willis, the CBS musical instruments staff, and others provides for a rare glimpse at the music history behind some of the most memorable music of our time. Guest Blogger: Benjamin Bove, author of Down the Rhodes: The Fender Rhodes Story, to be published in November 2013. Hal Leonard is celebrating September as National Piano month by taking a look at an upcoming release of Down the Rhodes: the Fender Rhodes Story. Anyone listening to music over the last 40+ years has undoubtedly heard the sound of the Fender Rhodes electric piano. It played an integral role in thousands of the most memorable recordings of all time, from many of the great artists of our time. It also continues to be popular and used in thousands of modern-day recordings as well. To explore the impact it had upon music is to explore music itself, and how its smooth sound changed the aural spectrum of songs. Down the Rhodes: the Fender Rhodes Story is a historical tribute to this electric piano; an inside look at both a remarkable cast of musicians, the inventor and technicians. The book includes in-depth interviews, photos as well as a full-length Blu-Ray DVD of the feature documentary. The book’s authors Gerald McCauley and Benjamin Bove put the project together because there wasn’t a sufficient historical reference about the Fender Rhodes. The stories behind the music that captured our ears, with artists: Chick Corea, Herbie Hancock, Donald Fagen (Steely Dan), David Paich (Toto),George Duke, Ray Manzarek (The Doors), Bob James, Patrice Rushen, Maurice White and Larry Dunn (Earth Wind & Fire), Quincy Jones and a score of other musicians share experiences with the instrument that shaped their music. An interesting historical note is that the piano was developed during World War II, as a rehabilitation instrument for injured soldiers. The inventor Harold Rhodes developed a teaching manual and a small, portable piano build from scrap airplane parts which had become so popular, roughly 250,000 soldiers had experienced his program during the war. The piano was later developed with Leo Fender and Fender Musical Instruments, and rose to popularity during the late 1960s. A must-have for any piano enthusiast or music lover in general, bonus material from the film is available via webisodes from www.FenderRhodesStory.com on YouTube.com to give you a taste of what’s to come from Hal Leonard before the end of the year!